The city of Worms, Germany, has a number of things that make it worth visiting. Worms is where Martin Luther was tried by the Catholic Church for heresy in 1521 and declared an outlaw and heretic. Today the city has some beautiful monuments that honor him. Worms also boasts the oldest Jewish Cemetery in Europe, with one grave dating to 1076 AD. Two churches, a Catholic cathedral and Trinity Church, which was built in Martin Luther's honor, are also worth visiting. Stan and I started our visit to Worms by visiting Trinity Church, a church built to honor Martin Luther. 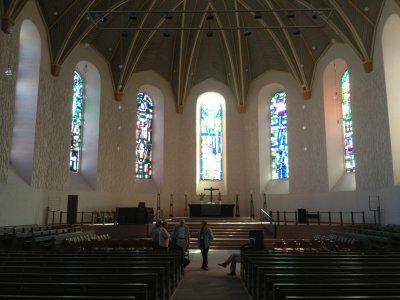 The picture below shows the front of the church from the inside and a look through the stained glass windows. 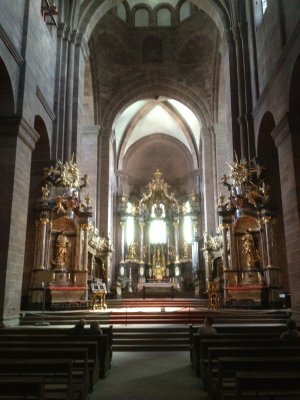 The picture below is also from inside Trinity Church in Worms. It shows the stained glass windows on one side of the church and a small part of the balcony at the back of the church. The picture below shows the balcony of Trinity Church. The art work or picture in the middle of the balcony in the picture above is worth describing. It is of the trial of Luther for heresy. The Emperor, King Charles, is seated hearing the case against Luther. On the left below the King is the representative of the Church or Pope presenting the case against Luther. And Luther is on the right below the King. Note the ray of sunlight beaming down on Luther as a sign that God was on Luther's side in the hearing. This painting or fresco was added when the church was rebuilt after World War II and is believed to have been patterned after a similar painting that was in the church before the war. Trinity Church was destroyed in an air raid during World War II. When the church was rebuilt, some of the artifacts from the previous church were included in the present day church. 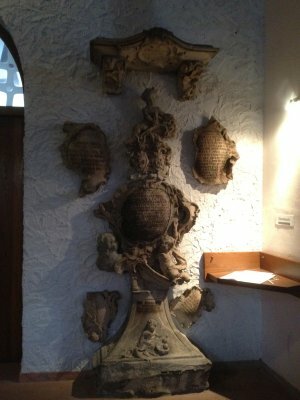 The picture below shows some of the artifacts from the earlier church. The picture below shows a metal plate mounted on the outside of Trinity Church, which tells about the former city hall and mint that once stood where the church is located and was destroyed by an army of French King Louis XIV. Stones from the former city hall were used to build the church. 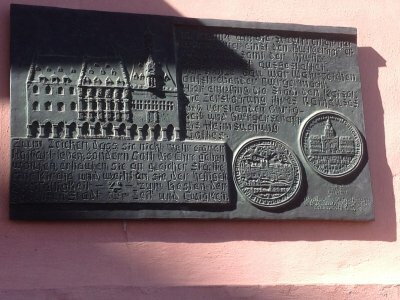 The Diet of Worms that was held in 1521 in the former city hall and mint that once stood where Trinity Church is located. Luther's trial was only a small part of the Diet, which conducted a lot of other business. 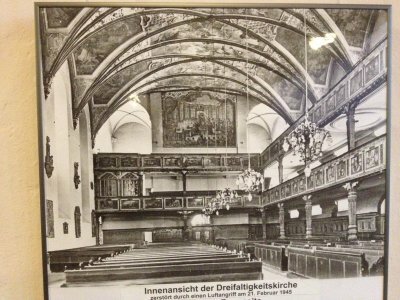 It was once believed that Luther's trial was also held in the city hall. 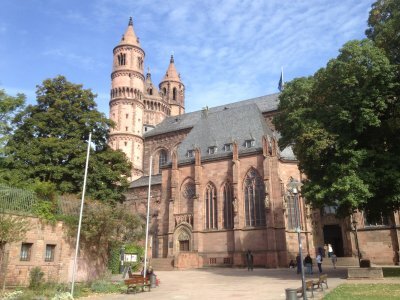 However, papers have been discovered that reveal that his trial was held at the Bishop's Quarters of the nearby Worms Cathedral. 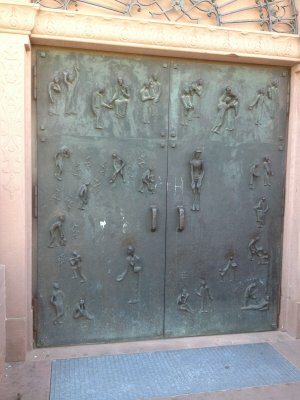 The pictures below are of decorated metal doors on Trinity Church. The pair of doors on the left show Biblical themes. The single door on the right draws a parallel between Sodom and Gomorrah of Biblical times and Worms during World War II. At the upper right of the door one may see Abraham praying symbolically for Worms. On the left side of the door one may see Lot's wife fleeing Sodom and Gomorrah. And on the bottom is a scene of Worms burning. 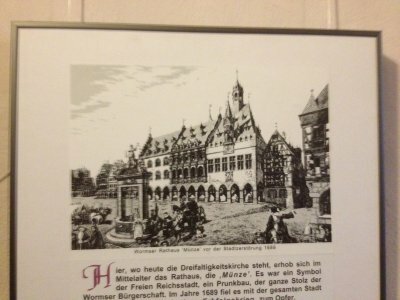 The picture below shows the original Rathaus or City Hall, which stood on the site where Trinity Church now stands. The building was called the Münze, for Mint. It was said to be a magnificent building and the pride of all of the citizens of Worms. The label at the bottom of the picture implies that the building was destroyed in 1689. This picture was mounted in present-day Trinity Church. The picture below is of the inside of Trinity Church as it looked before the church was destroyed in an air raid during World War II. The words in German at the bottom of the picture report that it is the pulpit and minister's seat. This picture was mounted in present-day Trinity Church. The picture below is another view of the inside of the old Trinity Church. The words in German at the bottom of the picture report that it was destroyed in an air raid on 21 February 1945. Worms was bombed more heavily than most German cities during World War II because there was a major bridge crossing the Rhine at Worms. This picture was mounted in present-day Trinity Church. 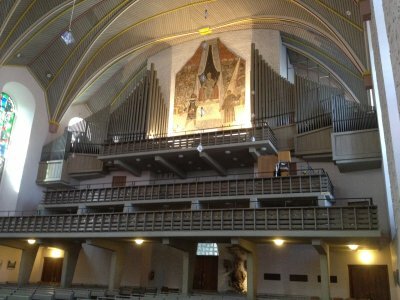 In the picture of the inside of the old church shown above, one may see the painting on the wall of the balcony. It is believed that this is a painting of Luther's trial that inspired the painting seen today in the balcony of Trinity Church. The picture below is another view of the inside of the old Trinity Church. The words in German at the bottom of the picture report that it was destroyed in an air raid on 21 February 1945. They also say that the view is, "Facing the altar and the organ." This picture was mounted in present-day Trinity Church. The picture below is of the old Trinity Church after it was destroyed during World War II. 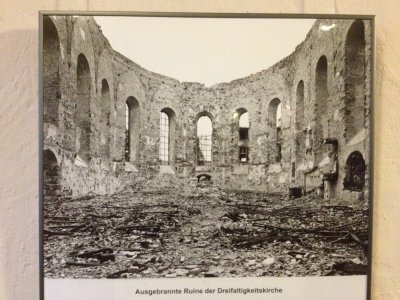 The words in German at the bottom of the picture say, "Burned out ruins of the Trinity Church." This picture was mounted in present-day Trinity Church. When the church was destroyed during World War II, it took some time to rebuild. However, the congregation still held church services in the church immediately after the war and for several years before a roof was added to the church. The picture below is another view of the inside of the old Trinity Church. 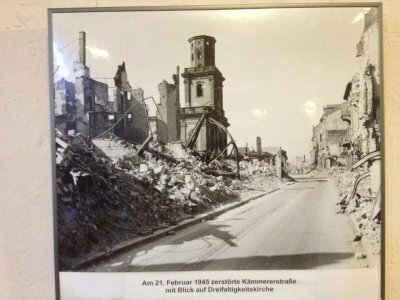 The words in German at the bottom of the picture report that it was destroyed in an air raid on 21 February 1945. 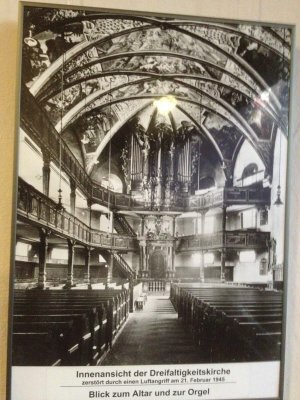 This picture was mounted in present-day Trinity Church. 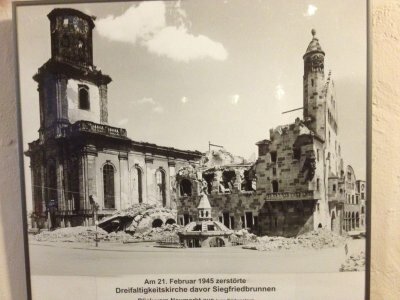 The picture below shows Kämmererstraße (Kammerer Street) in Worms after it's destruction in the air raid of 21 February 1945 with Trinity Church on the left. 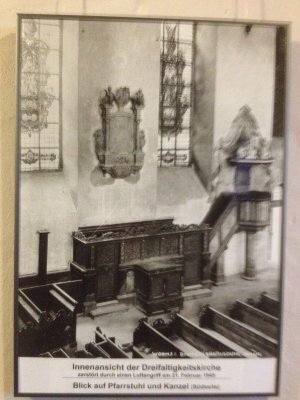 This picture was mounted in present-day Trinity Church. The name of Trinity Church in German is Dreifaltigkeitskirche. The GPS coordinates of Trinity Church or Dreifaltigkeitskirche discussed above are 49.630109N, 8.361711E. Click on the coordinates to see the location on Google Maps. 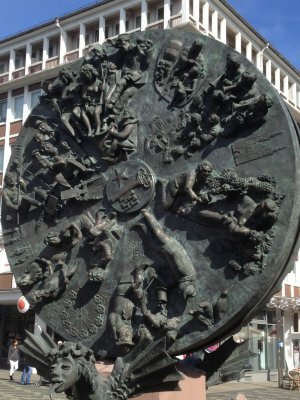 The pictures below show the time disk in the market square in Worms, which has scenes in relief of events that are important in the history of Worms. In the picture on the left one may see the cathedral between 2 and 3 o'clock on the disk. The key in the center represents Peter, Patron Saint of Worms. Other relief items are for other things important in Worms' history. The wheel turns as if telling the story from the beginning of Worms' history until the present and then begins all over again to tell the story again with each revolution. Interestingly, the Germans call it the Wheel of Fortune, probably after the American game show in which a large wheel is turned. However, the wheel at Worms turns a lot slower than the wheel in the American game show. The picture below shows two versions of a sign on a bank in Worms. The sun shone brightly on the top making it hard to photograph both the top and bottom in a way that made the words legible. The picture on the left has had the brightness and contrast adjusted to make it easier to see the words. 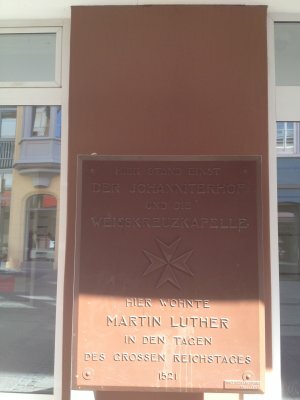 The words on the sign say that it was the former location of White Cross Chapel and that Martin Luther stayed there during the "Great Diet." Luther had been an Augustinian priest. And normally he would have been given a room with the other priests who were attending the Diet and were staying at the cathedral. However, he had already been excommunicated and was not allowed to stay with the others, which explains why he stayed in the White Cross Chapel formerly at the site of the sign. 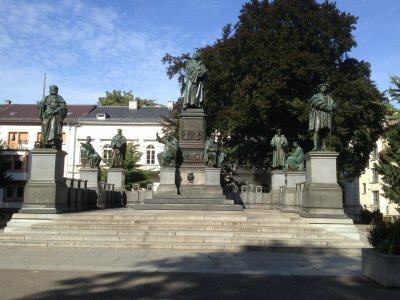 The picture below shows statues in Worms of Martin Luther and others who were played important roles in the Protestant Reformation. 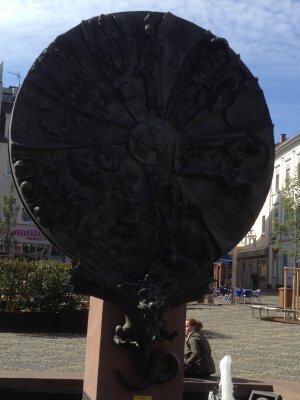 Martin Luther is standing in the center. Beside Luther are Frederick the Wise of Saxony and Philip of Hesse, two princes whose support was critical to the political success of the Reformation. Behind Luther are Johannes Reuchlin and Philipp Melanchthon, two scholars who were important to the Reformation. Seated around Luther are Peter Waldo, John Wycliffe, Jan Hus and Girolamo Savonarola, considered the main forerunners of the Reformation and also the victims of the Catholic Church's reaction to their outspoken preaching against the Church's excesses. Peter Waldo was declared a heretic and excommunicated from the Church. The Church's delayed reaction to John Wycliffe is quite interesting and unusual. Thirty years after his death, the Catholic Church declared him to be a heretic, had his body exhumed, burned, and his ashes thrown into a river. Jan Hus was burned at the stake for heresy. Girolamo Savonarola was first hanged and his body then burned for heresy. Luther would likely have been put to death also had it not been for the support of the princes cited above. The statues of women who are seated around Luther represent the German cities that first adopted Protestantism. 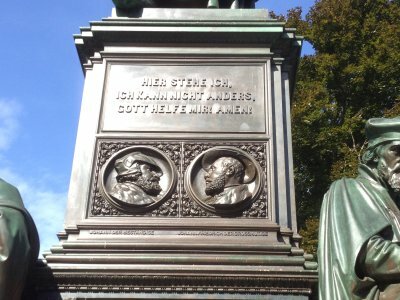 Names of other towns that were important in the Reformation also appear with the statues. 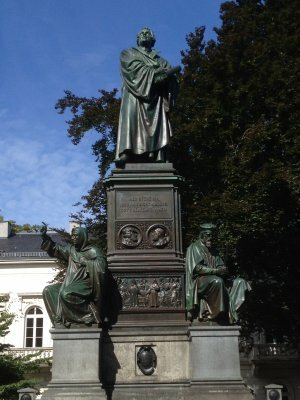 The statue complex for Luther and the others shown above is the primary statue for representing the Protestant Reformation. It was designed of large stones with three strong walls surrounding it. It is intended to represent a fortress as in the song, "A Mighty Fortress," which Martin Luther himself wrote. The GPS coordinates of the Martin Luther Monument are 49.63227N, 8.360068E. Click on the coordinates to see the location on Google Maps. The picture below shows a close-up of the statue of Martin Luther in Worms. One interesting thing of note about this statue is that it is one of two that are identical. The other that is like it is located at Luther Place Memorial Church on Vermont Avenue in Washington, DC. 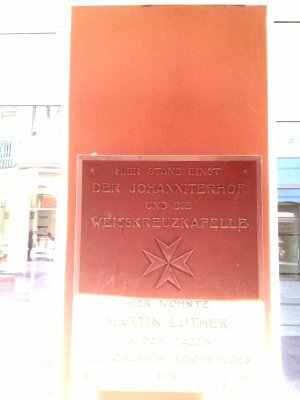 The picture below is a closer view of the pedestal on which Martin Luther is standing and gives a better view of the text on the sign on the pedestal. In German it says Hier stehe ich, Ich kann nicht anders, Gott helfe mir! Amen! This translates to something like Here I stand, I can do no more, God help me! Amen! 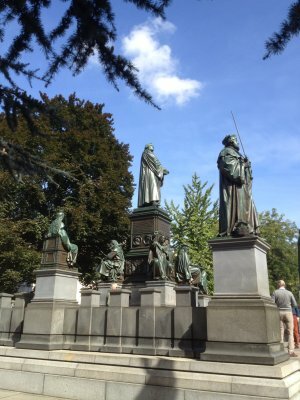 The picture below shows another view of the statues in Worms of Martin Luther and others who took a stand against the practices of the Catholic Church over the years. 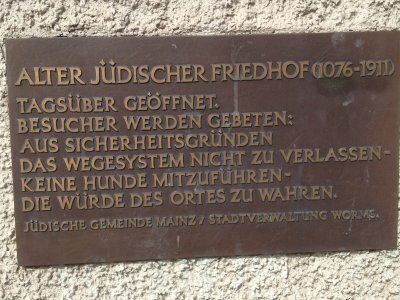 The picture below is the sign at the entrance to the old Jewish cemetery in Worms. 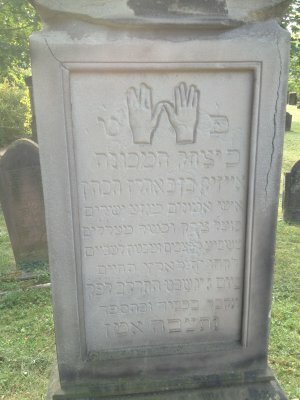 The GPS coordinates of the entrance to the Jewish cemetery are 49.629704N, 8.356736E. Click on the coordinates to see the location on Google Maps. This cemetery is the oldest Jewish cemetery in Europe. One of the graves dates to the year 1076 AD. Prior to Kristallnacht in November 1938, when the Nazis instigated attacks on Jewish homes and properties all over Germany, there was a large population of Jews in Worms, especially Jewish scholars. After World War II, the Jewish population in Worms ceased to exist. Today there are very few if an Jews in Worms. Incidentally, Kristallnacht means Night of Broken Glass, when glass in homes, shops and synagogues of Jews was broken. It was the presence of Jewish scholars in Worms that drew William Tyndale of England to Worms in the early 1500s. Although the Bible was available in several European languages, no English Bible existed. And rather than translate the Bible into English from the Latin version authorized by the Catholic Church or from one of the European languages, Tyndale intended to translate it from the original Greek and Hebrew to improve the accuracy of the translation. When the Catholic Church learned of Tyndale's plans, they issued an edict against such a translation into English. But Tyndale ignored the edict. Although Tyndale was familiar with Greek, his grasp of Hebrew was not sufficient for him to translate the Bible from Hebrew. Also, at that time England had expelled Jews from the country. So Tyndale, wishing to use Jewish scholars as a sounding board for his translation, went to Worms to do his translation. There he used Jewish scholars to insure the correct translation from Hebrew. It is an interesting historical footnote that the first English translation of the Bible was printed in Worms, Germany. Once Tyndale had completed his translation of the Bible into English, he had it printed in Worms. Since Worms was situated on the Rhine River, it had a ready supply of paper for printing. English‑language Bibles printed there were smuggled into England by placing them in cargo bound for England. In 1535 Tyndale was arrested and placed in prison in Belgium. A year later he was tried for heresy and executed by strangulation. His body was then burned at the stake. His dying wish was that the eyes of the King of England would be opened. Two years later King Henry VIII, then King of England, authorized "The Great Bible," which became the first authorized Bible in the English language. Much of it was based on Tyndale's translation of the Bible. Thus, after his death, Tyndale's views continued to influence the Protestant Reformation. It has been estimated that more than 75% of both the Old Testament and New Testment portions of the King James Version of the Bible, which was completed in 1611, are verbatim from Tyndale's version of the Bible. The pair of graves in the picture below are of two Jewish men who were revered in the Jewish community, Meir of Rothenburg on the left and Alexander ben Salomo Wimpfen on the right. Meir of Rothenburg was a respected rabbi and poet. During an earlier persecution of the Jews in 1286, Meir of Rothenburg attempted to escape with his family but was captured and imprisoned. Tradition holds that his supporters raised a huge sum of money as a ransom to gain his freedom. But the rabbi refused it out of fear that it would only encourage the capture and imprisonment of other rabbis. He died in prison in 1293, seven years later. However, the King, who had imprisoned him, would not release his body to his followers. Fourteen years later Alexander ben Salomo Wimpfen, on the right in the picture, paid a huge ransom for his body in return for the privilege of being buried next to the rabbi. 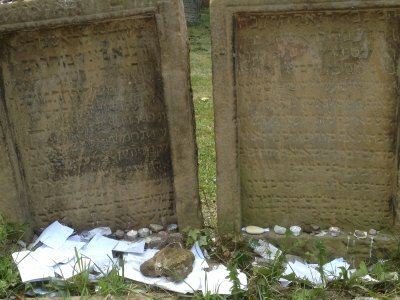 The rocks placed on top of the grave markers in the picture above are part of a tradition among Jews. This is believed to have grown from the practice of Jews in Palestine placing rocks on graves of people they buried in the soft ground to prevent animals from digging up the body. Over time it is believed the practice transitioned to become a sign of respect. 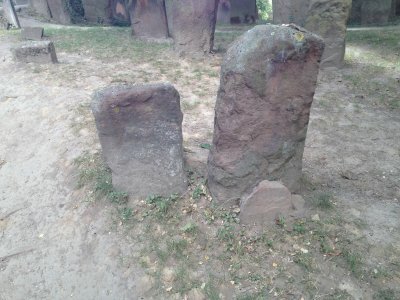 The picture below shows a closer view of the graves of Meir of Rothenburg on the left and Alexander ben Salomo Wimpfen on the right. 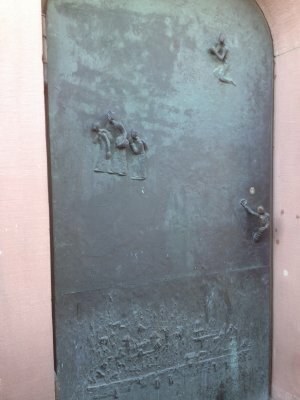 The picture above shows many notes on grave of rabbi. The people leaving the notes, believing he is in heaven, hope for him to read them so that he can be an intercessor for them. It is sort of like when Jews leave notes in wailing wall in Jerusalem. 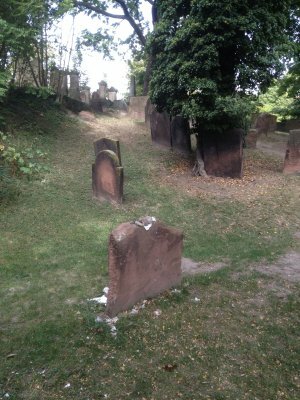 The picture below shows some of the graves in the Jewish cemetery in Worms. 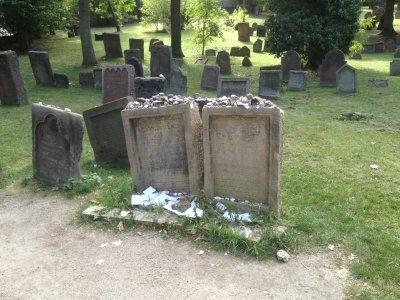 The picture below shows another view of some of the graves in the Jewish cemetery in Worms. 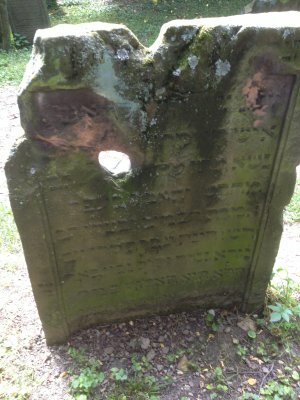 The picture below shows one of the graves in the Jewish Cemetery in Worms with the inscription in the old Hebrew writing. Also seen are the hands pointing upward with the fingers separated. These are known as "Blessing Hands." The grave markers with Blessing Hands are for men who belonged to the priestly order of Jews and were descendants of the Levites. These men held positions of authority in the church and often had names like Cohen and Cahn, Kuhn, and variations of these names. The name Cohen in Hebrew means priest. 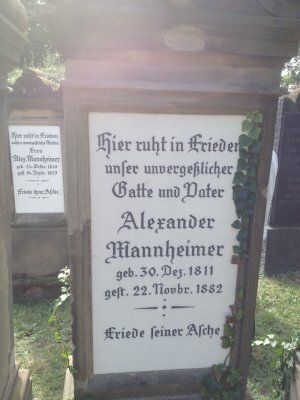 The picture below shows the grave marker for Alexander Mannheimer with the inscription in German. When Napoleon conquered this region of Germany in the early 1800s, he mandated that people have family names, which is why names like Mannheimer appear in the cemetery around this time. Note also that the inscription on the grave marker is in German. Names in the older part of the cemetery were in Hebrew. In the newer part of the cemetery names are in German. It is not known if the sudden use of German inscriptions is because the Jews gradually moved away from using Hebrew or if some government mandate required them to use the German inscriptions. The grave marker in the picture below shows evidence of shooting in the vicinity during World War II. One may easily see bullet holes in one of the inside walls of the cemetery near this marker also. This Jewish cemetery is unique among Jewish cemeteries in that the graves do not face Jerusalem. The only exception is the one grave shown in the picture below. The person buried under this marker insisted on having his marker facing toward Jerusalem. 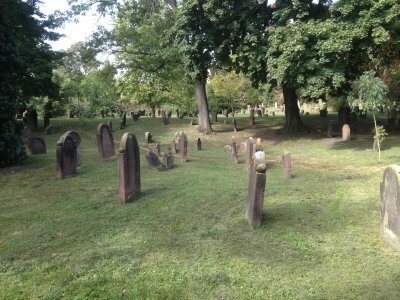 The picture below shows the old grave markers. The one on the right is the oldest marker in the cemetry, said to date to 1076 AD. 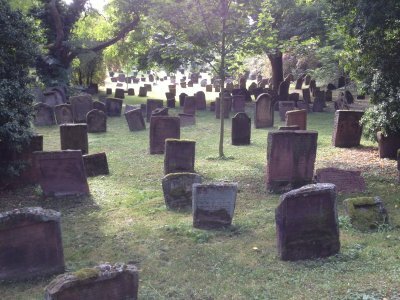 One might wonder how a Jewish cemetery survived the years the Nazis ruled Germany with all of the killing of the Jews and the destruction of their property. It was reported that Heinrich Himmler visited Worms early in World War II and actually was shown the cemetery. Some time later one someone in Worms wanted to plow under the cemetery to build something. A quick thinking resident, probably knowing the historical value of the cemetery, stepped forward and confidently reported that Himler liked the cemetery when he visited it and that he would be displeased to learn that it had been destroyed. There was never any evidence that Himler ever voiced an opinion on the cemetery and likely might have even called for its destruction if asked. However, a quick thinking resident took a chance and preserved the cemetery from destruction during World War II. 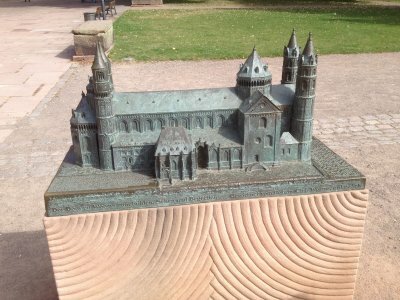 The picture below shows a scale model of the Catholic Cathedral in Worms. This cathedral goes by many different names: Worms Cathedral, St. Peter's Cathedral, Kaiserdom, Wormser Dom, Dom St. Peter and Dom Sankt Peter. This scale model is on the cathedral grounds just outside the cathedral. It has has lots of braile writing on it so the blind can read all about the cathedral in addition to feeling the shape of the cathedral. The GPS coordinates of the Worms Cathedral are 49.630151N, 8.359764E. Click on the coordinates to see the location on Google Maps. 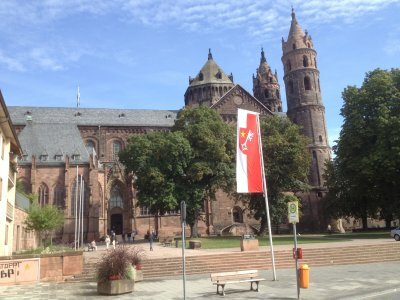 The picture below shows the actual Catholic Cathedral or Worms Cathedral. The cathedral has an interesting history. During one of the wars between France and Germany, France conquered the area around Worms. Citizens of Worms, thinking the cathedral would be spared, placed a lot of their furniture in the cathedral. The French burned it anyway. For a while afterward, the area inside the cathedral was used as a barn. 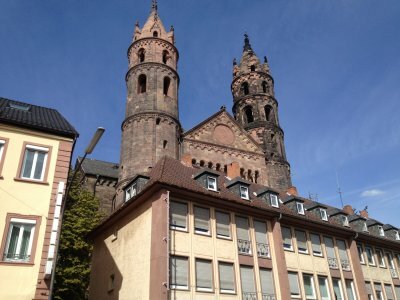 And the picture below shows a view of two of the towers on Worms Cathedral. 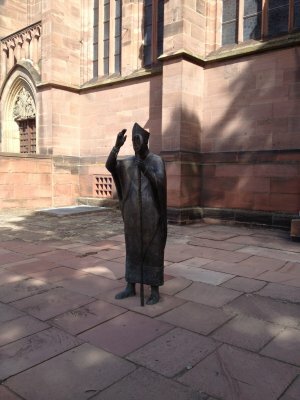 The picture below is of the statue of Bishop Burchard outside Worms Cathedral. Worms Cathedral is also known as St. Peter's Cathedral. 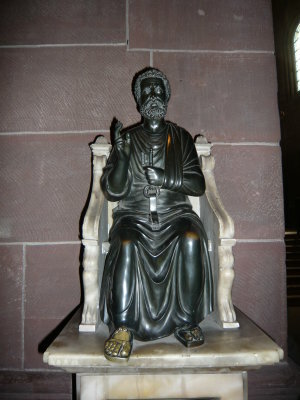 The statue in the picture below is of St. Peter. Note how his right foot and to a lesser extent his knees have been polished. Many visitors rub his right foot or one of his knees for good luck. 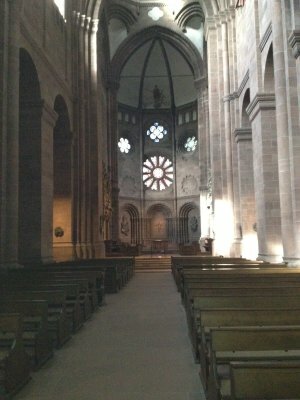 The pictures below show views of the inside of Worms Cathedral. The picture below is of one of the stained glass windows at Worms Cathedral. 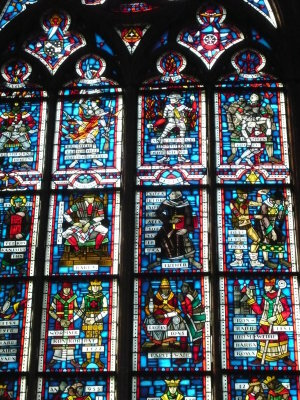 The thing that makes it interesting is the panel with Martin Luther, which may be seen in the rectangular array of panels two rows from the top and two rows from the right in the picture. Luther is dressed all in black, possibly to signify that he was considered a sinner by the Catholic church, and is holding a red book. An interesting note of history is that the Lutheran Church has called on the Catholic Church to lift Luther's excommunication. Although comments by recent Popes have softened considerably the Catholic Church's position regarding Luther, the excommunication has not been lifted. 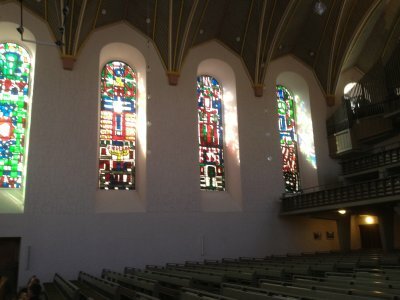 Given the Church's current position on Luther, is it possible that the panel about Luther in the stained glass window above was added in anticipation of huge crowds expected to visit Worms in 2021 on the 500th anniversary of the Diet At Worms when Luther was declared a heretic? 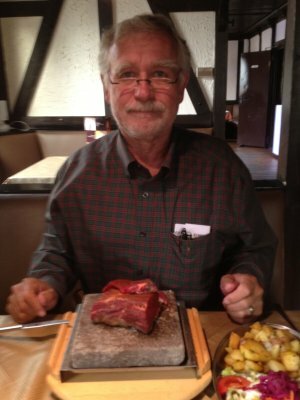 When Stan and I left Worms, we headed toward Frankfurt to a motel near the airport to stay the night and be close to the airport for an early flight the next day. When Stan and Jan lived in Germany and had to catch a flight, they always stayed the night before at the same motel in Raunheim near the airport. And they always ate dinner at the same restaurant near the motel. The name of the restaurant in German was Zur Ziegelhütte. The sign on the restaurant also had the English words, "Corner Steakhouse." Since Stan was accustomed to eating at this restaurant and liked the food, we decided to eat there, a walk of about half a mile from the motel where we had checked in. As we were approaching the restaurant and standing on the corner waiting to cross the street, Stan snapped the picture below and attached it to a text message he intended to send to Jan that said, "Guess where I'm eating tonight." However, before he could send his message, a message arrived from Jan declaring, "I know where you're eating tonight." Stan immediately hit the send button to transmit the picture and his message to Jan. He followed it immediately with another text message asking Jan, "Do you have someone spying on us?" 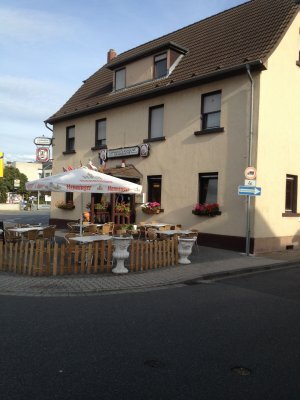 The GPS coordinates of the Corner Steakhouse are 50.015227N, 8.456486E. Click on the coordinates to see the location on Google Maps. Stan and I were both hungry and ordered big meals. 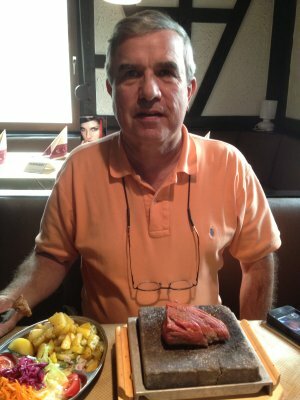 The steaks they sell are brought out raw on a large slab of hot granite that cooks the meat in front of you. We just cut off chunks of the meat and placed the side of the meat we wanted to cook against the hot granite. It was excellent. The pictures below show Stan and me with our steaks. When we left the restaurant and headed back to our motel, we passed a place that sold grave markers. In the fenced yard beside the place were lots of markers and one curious thing that caught my attention, a scale model of R2D2 from the Star Wars movie. I just had to photograph it. I have no idea why it was there. Possibly someone planned to use that as part of their grave marker. Who knows? 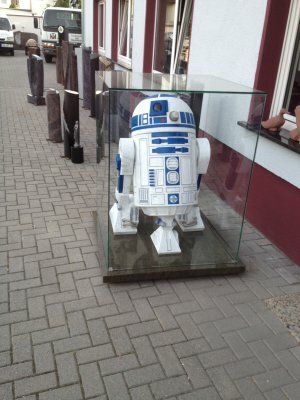 In the background behind R2D2 one can see a few of the grave markers in the yard beside the sales office. The next morning Stan and I rose early and headed to the airport on the bus that runs from the motel to the airport. 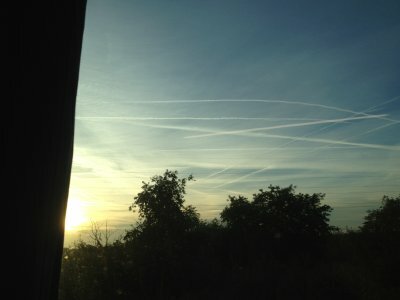 As we were riding, I noticed several contrails of jets in the sky over Frankfurt, which may be seen in the photo below. They weren't rainbows. But we took it as a sign that we were going to have a good day and a good flight back, which we did. Stan and I both had a great time. For me it was the trip of a lifetime to visit the ancestral home of the Garn family, to see the vineyards where they worked, the church where they worshipped, the old church books with records of their births and christenings, to stay in a guest house where they might have stayed and to walk the streets that they walked. The other places we visited while in Europe just made the trip more memorable. I'd go back in a minute.